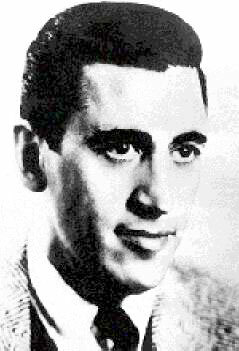 J. D. Salinger (Jerome David Salinger) was born in New York City in 1919 to Sol and Miriam Jillich Salinger (his father was Jewish; his mother, Scotch Irish). He has a sister Doris 8 years his senior. He attended public schools on Manhattan's upper West Side, the private McBurney School in Manhattan, and then Valley Forge Military Academy in Pennsylvania, from which he graduated in 1936. His college experience was brief: a summer session at New York University, a short-story writing class at Columbia University taught by Whit Burnett, co-editor of Story, and a short period at Ursinus College in Pennsylvania. In 1955 he married Claire Douglas; they have a daughter and a son. Salinger is noted for what has been called a "reverse exhibitionism," that is, a determination to keep his life private. By 1941, when he was 22, Salinger was publishing in well-paying magazines such as Collier's and Esquire. It was in 1948 that he began to find real recognition, with the publication of three stories which later were to appear in the collection, Nine Stories: "A Perfect Day for Bananafish," "Uncle Wiggily in Connecticut," and "Just Before the War with the Eskimos," all appearing in the New Yorker, certainly a prestigious sign. In 1949 and 1950 three more stories from his collection were published - "The Laughing Man," "Down at the Dinghy," and "For Esme - with Love and Squalor." The Catcher in the Rye became upon publication in 1951 what might be termed an almost-immediate success.